At Eden Construction in Orlando, FL, we can help you improve the look of your home and help to increase its curb appeal with the addition of beautiful vinyl siding. Are you tired of the way your house looks and want to come home to a house with an attractive exterior at the end of your work day? Vinyl siding is a type of home exterior that is an affordable and durable alternative to other forms of siding, such as wood or aluminum. At Eden Construction, we can help you improve the look of your home and increase its curb appeal with the addition of vinyl siding. It does not need to be painted or sealed and is practically maintenance-free. It lasts up to ten times longer than wood siding. It is not subject to termites or other pests that destroy wood. It comes in a variety of colors, styles, and options allowing homeowners to create a completely unique look for their home. It is more affordable than other types of siding, such as wood or aluminum. If you want to make your home stand out from the others on your street, vinyl siding is extremely advantageous because it comes in a variety of different colors and styles. Not only does vinyl siding open up a world of possibilities for your home, but it is affordable, and you won’t have to spend your weekends maintaining it. Let Eden Construction handle the installation of the new vinyl siding on your home. 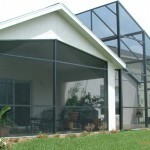 We have many years of experience and are known throughout the Orlando, Florida area for our high-quality service. For more information on vinyl siding installation, contact us today. We are a member of the Aluminum Association of Florida, Home Builders Association, and Better Business Bureau. All our workmanship is guaranteed for 2 years, a waiver of lien is supplied at the end of the job, and projects are insured with full-coverage liability insurance. Spruce up your home with a beautiful new screen room! Interested in home remodeling? Get as much as $200 off from Eden Construction! Winter Park and 50 mile radius including, Orange, Seminole, and Osceola counties and cities of Orlando, Clermont, Deltona, and Deland.